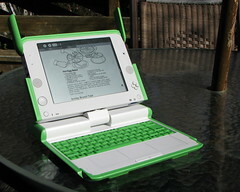 On today's episode of Your Day, we talked about the OLPC XO laptop. I got the laptop during last year's Give One Get One program and have been impressed by the design. I can't imagine that this laptop is for everyone, which is good, because they are actually hard to come by. I hope that enough ended up in people's hands so that there is some great software developed for it. By the way, we'll be live on Wednesday at noon.